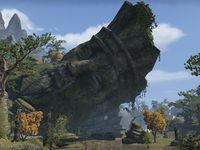 The Weeping Giant is a ruined statue in eastern Stormhaven, west of the Bangkorai bridge. The Supernal Dreamers are camping out near the statue after stealing some relics from the nearby Shrine to Azura. Weeping Giant Objective: Recover the artifacts and foil the Supernal Dreamers plans. The Towers' Remains : Locate the final four pieces of the Staff of Towers. 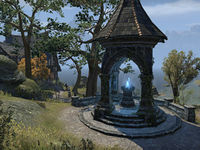 Weeping Giant Wayshrine ( Leveled(?) XP) is located south of the site. Weeping Giant from above the waterfall.